OTAS Lingo creates automated, natural language reports, which provide you with up-to-date analysis of all the standout and unusual activity in stocks that you care about. Lingo will enhance daily market reports, inform risk management decisions and keep you up-to-date with the latest developments in markets and portfolios, at your desk or on the move. Access Lingo from the OTAS Launcher and type the watchlist or sector that you want to see into the search box, or choose an index from the extensive list. 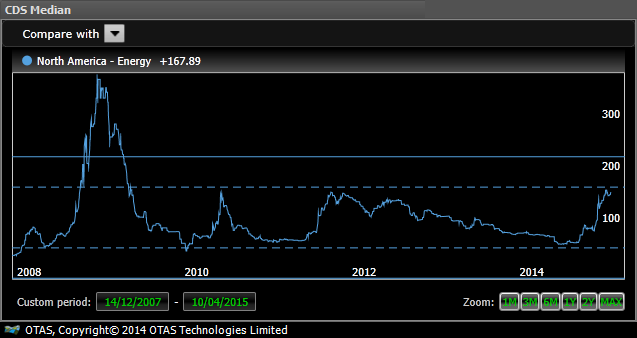 In the example below, I have chosen to generate a report on European pharma stocks. Lingo immediately generates a report on the sector, detailing calendar events taking place today and highlighting the most significant changes in price performance, short interest, credit, valuation, yield and technicals, as well as any meaningful, recent director (insider) dealing. The text is easy to read, free-flowing and succinct and is all machine generated so you know that the most significant changes are being highlighted, without the emotion and bias of human reporting. For example, here is the comment on overnight moves in short interest. The copy button in the top right hand corner makes Lingo reports easy to share, incorporate into your own reports, or save for future reference. Watch out for Lingo weekly, monthly and quarterly reporting and do let us know the analysis that you would most like to read, such as stock summaries or detailed portfolio profiles. Lingo is here to save time, improve efficiency and increase understanding of the factors that determine share prices. Core Summary is accessed through the Components button on the OTAS Launcher. Type a stock into the Launcher search box, or select one from your TradeShaper Order Pad. 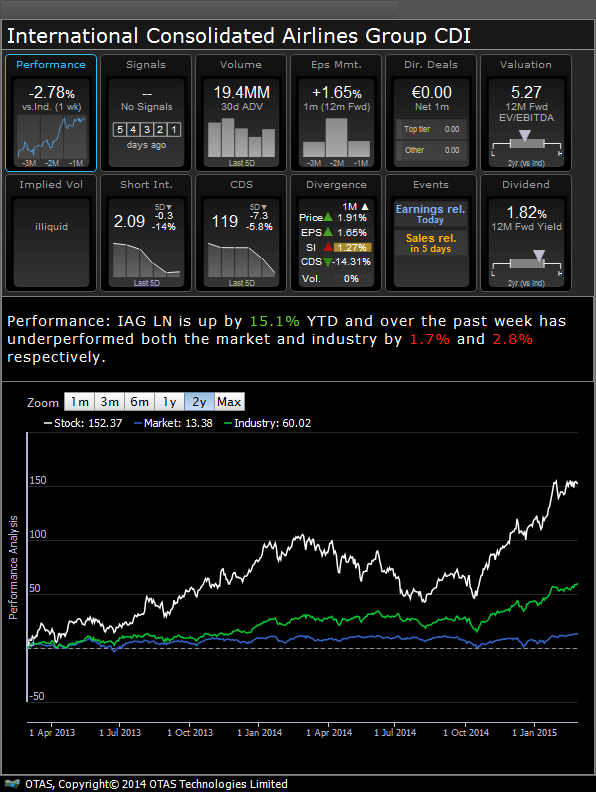 IAG has reported results this morning and should see an active day’s trading. Typing the stock into OTAS Launcher brings up the Microstructure that enables you to see the detail of today’s trading and the Core Summary that provides a quick view of the key positioning in the stock, which may influence today’s activity. Behind each stamp is one, straightforward chart showing what has been happening in that OTAS factor and a text explanation from Lingo. In IAG’s case, we see a stock that has underperformed the sector over the past week as the price reached a resistance level ahead of numbers. Over the past month the Divergence stamp shows that the price has risen along with EPS Momentum, while CDS has fallen, which is expected to be supportive of the share price. The rise in short interest over four weeks is divergent from the share price trend, but the Short Interest stamp shows that the level has retreated 14% in the week before the earnings release. Operating profit is slightly ahead of expectations and the stock is up almost 5% at pixel time. The Core Summary may be copied using the button in the top right hand corner. Use it to add colour to reports, emphasize significant developments and to record market positioning at the time of an investment decision. OTAS is evolving with regular upgrades to functionality designed to assist traders and portfolio managers in day-to-day workflow. Pop up screens such as Lingo and Core Summary may be included in your own internal software, or third party platforms that you use every day. Please contact us for more details, or speak to your software supplier and ask about integration with OTAS. Mattel vs. Hasbro – Time yet for a Transformation? After both toy makers reported Q4 earnings recently, we can use the Pair View in OTAS to compare the two companies to see where there may be stress or opportunities developing. With a weak Q4 report and concerns with recent top management changes, Mattel (MAT US) is showing signs of continuing strain. Hasbro (HAS US) has enjoyed a decent run despite missing Q4 expectations, putting fundamentals into overstretched territory with momentum waning. 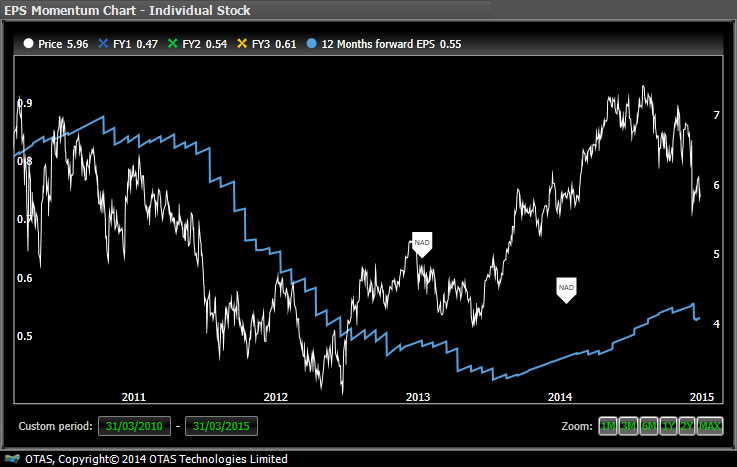 Looking at both stocks side by side in OTAS, one can see that both stocks are showing risks but for different reasons. As US energy names begin to stabilize on oil price recovery, the media is starting to highlight a potential short squeeze in energy names. We take a look at the short interest, or % of free float on loan, in OTAS to determine names with potential short squeezes. The current estimate for 2015 sales across the S&P 500 companies is 0.3% below that for 2014, while earnings are expected to rise 4.8%. The sales slowdown is primarily attributed to the strength of the dollar and the weakness in the oil price. Yet the Brent crude March 15 future has closed above its 50 day moving average for the first time since late July last year and is up 21% from the mid January low. EPS Momentum for the average S&P stock is -0.73%, having fallen from being almost flat in the previous two months. EPS Momentum across the Energy sector is -29%, while the next worst industry group is Materials at -4.2%. Only the 37 stock Food & Staples Retailing sector has positive EPS Momentum over the past month. Pantry, Safeway and Casey’s General Stores head the upgrades among US names in this sector. Yet at the individual stock level, 146 names, or 29% of the total, have positive EPS Momentum and there have been double digit upgrades at five companies, which are Southwest Airlines, Target, Level 3 Communications, Electronic Arts and Alcoa. The list of worst momentum is dominated by Energy stocks, which account for 30 of the 36 most severe downgrades over the past four weeks. However, it is not all gloom across this sector. The median stock is up over 5% in the past week, while backtested positive technical indicators have fired on 47 of the 395 names (12%) and negative on only nine. The cost of credit is close to the highest level since May 2009, but would appear to have topped out at a resistance level just below the top end of the long term average range. 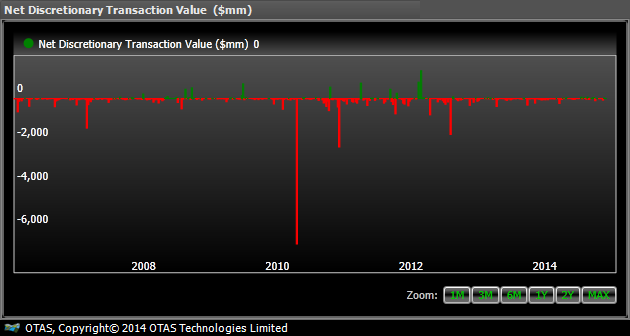 Net insider selling was $61m over the past month, but this is a tiny blip on the long term chart and there has been net buying in the last two days. Of the six stocks where backtested positive technical signals fired overnight, the most significant is for the largest name Valero Energy, which is also in the top 10% of EPS Momentum in the sector (+6.2%), with low sector relative implied volatility and an unusually rapid tightening in the CDS over the past week. The sector relative CDS level has fallen to a most exceptional low. 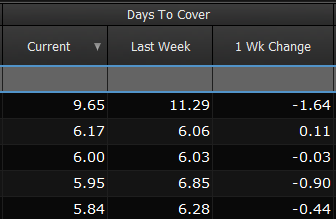 Four names with backtested positive signals over the past week are also in the top 10% of EPS Momentum in the sector, with Marathon and Enbridge the two larger cap names on this list. Over in Europe, the Energy downgrades are also sharp, but not to the extent seen in North America. Directors have been net buyers of shares over the past month and while implied volatility is above the average level for the last year, it has fallen in the past five days, which may indicate a more positive trend for the sector. However, there are no backtested positive signals for European Energy names that are also in the top 10% of EPS Momentum for the sector, and the largest share in the top 10% is Neste Oil in Finland. Even though the stock is down 12.5% over the past week, its forward valuation remains at the long term high relative to the sector and the CFO made his first discretionary sale of the shares towards the end of last week. The top level directors in this name backtest well, with the shares having risen after they bought and fallen after they sold, in the six months following the deals over the past eight years. The oil price has staged something of a recovery and is trading just above an interesting technical level. Energy shares have responded by trading up over the past week, while the downgrades continue thick and fast from the analyst community that is working its way through reporting season. The downgrades are so severe that they have had a major impact on the aggregate S&P 500 forecasts, but with the price recovery seemingly underway, we may be at the low point of estimates for the index. It has been a satisfactory start to the year for our portfolio of UK winners identified from the OTAS characteristics that were common among the best performing stocks in 2014. This list was selected at the end of November from shares with high valuation and yield, and low absolute short interest, CDS and implied volatility. Our portfolio of 20 stocks is up 6.2% YTD compared with 3.2% for a list of 20 stocks with the opposite characteristics and only AstraZeneca among those identified as winners is down so far this year. The FTSE 100 is up 3.4% over the same period. Since inception, the portfolio of roughly equally weighted winners has risen 3.6% and the similarly constructed losers just 0.7%. The top performing stocks among the winners have been Hammerson and Land Securities, followed by Friends Life, GlaxoSmithKline and Imperial Tobacco. 9 of the 20 stocks identified as losers have fallen in price YTD, although there have been some strong recoveries from the likes of Tesco, Fresnillo and IAG. 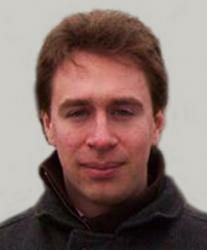 At the time we noted that creating a portfolio to be held for a year based upon a snapshot of analysis would create factor risk that reflected the investor mood at the time and at the end of November UK food retailers and certain commodity plays were taking a beating across a range of asset classes. Our preferred methodology would be to repeat the OTAS analysis over a period of weeks or months and to construct our winners and losers a few stocks at a time, but we recognise this is not an option for the investor who must be fully committed straight away. Across the FTSE 100 median short interest is currently 38bps, implied volatility 24.1 and CDS 63.6. 33 stocks have values at or below these three averages and of these the highest relative valuations to their respective sectors are for Hammerson, National Grid, BG Group, Reckitt Benckiser, Imperial Tobacco and Friends Life. The most attractive relative yields from the 33 are at Barratt Developments, Taylor Wimpey, Rolls-Royce, Direct Line and Diageo. The reason that high valuation and dividend yield were chosen as characteristics of potential winning stocks in 2015 was purely because they had worked to identify winners, alongside the other OTAS factors, in 2014. It is worth noting that stocks such as British Land and Land Securities are highly valued in P/E terms, which is the valuation criteria that we used, but not the default OTAS real estate metric of price to book value. Short interest is rising at United Utilities, Centrica and Saint James’s Place meaning that they might drop out of a list of winners compiled on February 9, 2015. Among the losers Shire had very high short interest at the time of compiling our list, but is now at the opposite end of the spectrum and would be pressing to be included among a list of winners rather than losers today. No other stocks from our losers have experienced a change in OTAS factors that would lead them to be selected in a list of what should be higher quality, steadily performing shares. 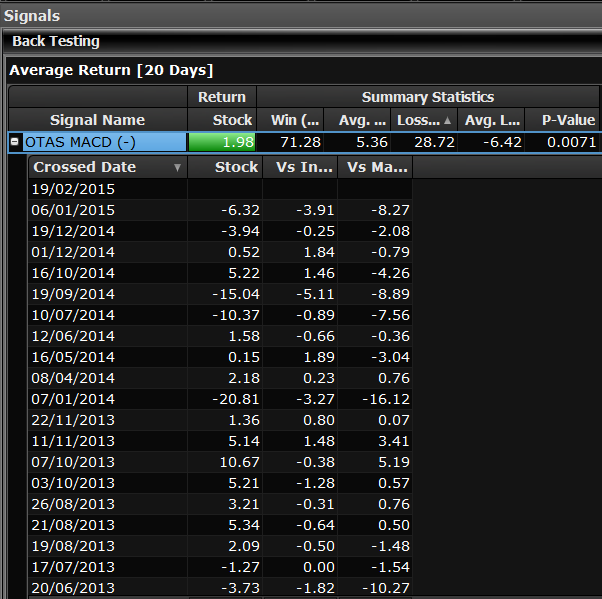 However, the losers would be expected to do well if we have a beta driven rally that favours leveraged names. A good way to identify the likely out performers in such a scenario is simply to rank stocks by implied volatility within OTAS and choose those with the highest values. 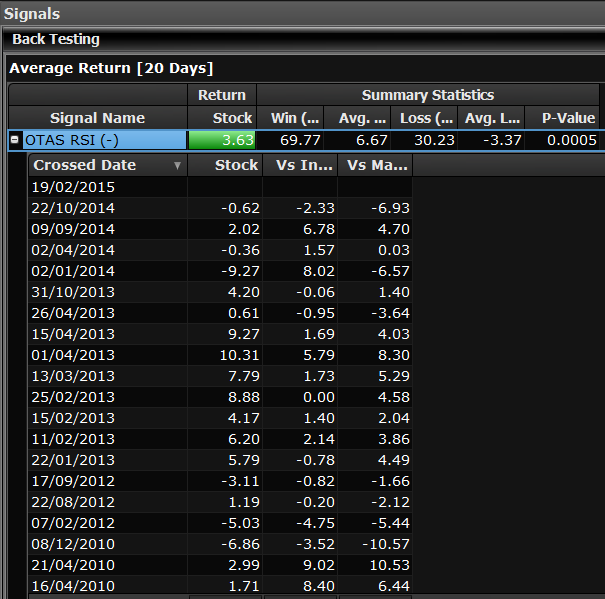 However, the prevailing trend in FTSE median implied volatility is down. With the recent collapse in oil prices straining energy companies’ profit models, it’s interesting to see an oil executive buying his own stock. 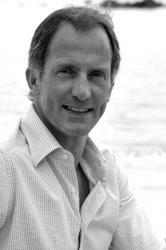 On February 2nd, CEO John Hess purchased nearly $2 mm worth of stock. This is the first time in three years he has bought stock and his transactions have been fairly well-timed, on both the sales and purchases. “All things are subject to interpretation. Whichever interpretation prevails at a given time is a function of power and not truth.” Friedrich Nietzsche. Seventy four of the STOXX 600 report earnings this week. From a technical perspective, those with the highest price momentum into numbers include Neste Oil, Dassault and Daimler, while those with the lowest and hence the most unloved are ABB, Santander and Statoil. The share price of the banks suggests that the ECB has lost its ability to influence markets. Of all the companies reporting, only Alfa Laval has best in sector EPS Momentum married with exceptionally low relative valuation. This is important as in the past an apparently attractive valuation has proved deceptive for the name and so the 2.9% upgrade over the past month, and the steady improvement in EPS Momentum over the past three months, is worthy of note. 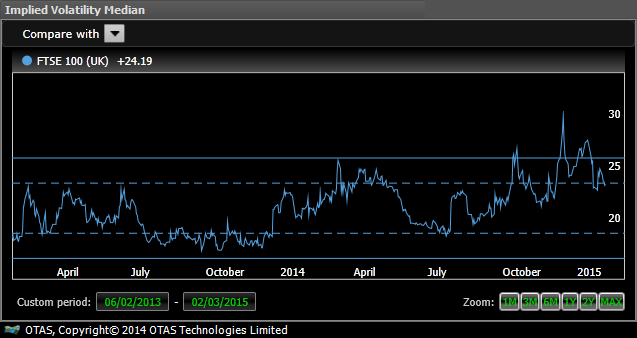 The shares also have very low relative option market implied volatility, which may be a bullish signal. A high number of days-to-cover short interest indicates the potential for a short squeeze, should numbers surprise positively. There are double digit days-to-cover at EMS-Chemie, TalkTalk, TGS-Nopec Geo, Hargreaves Lansdown and Nokian Renkaat. Conversely, there is very little short interest at a number of the big banks reporting, such as BBVA, BNP Paribas and Santander. Short interest has risen rapidly at only one reporting stock, which is IAG, but this is likely to be related to the continuing interest in Aer Lingus as opposed to the sales release on Wednesday. Over the past month there has been priority insider dealing at only two of the companies reporting. The Osram Licht CEO put half a million euros into the shares at the beginning of the year. 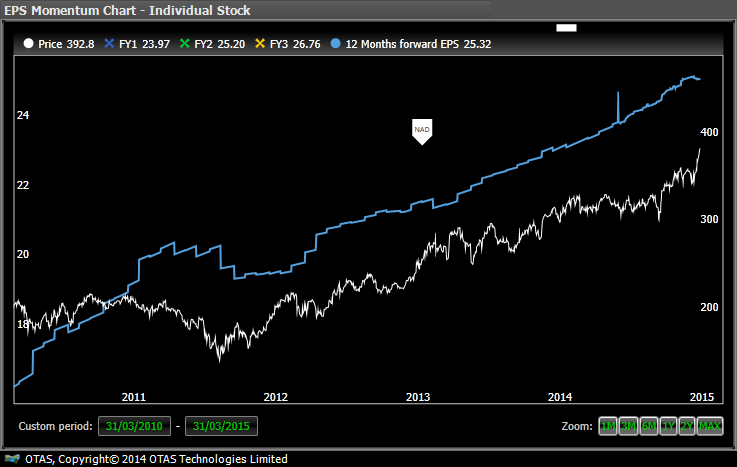 EPS Momentum on the name is +17%, which is in the top three of all stocks reporting and there is backtested technical support, while the valuation is comfortably mid range when set against peers. Meanwhile the CFO of Vinci has sold €1.3m worth of stock, after selling a similar amount during 2014. EPS Momentum is -1.9% over the past month, although not especially noteworthy in the context of the capital goods sector, where average EPS Momentum is -0.5%. Of the sixteen banks reporting across Europe, price momentum is strongest at the Scandinavian banks, suggesting expectations are highest here. Danske Bank is trading very close to an all time high sector relative valuation. Price momentum is lowest for the Iberian banks, especially Santander. It is clear from the chart of forward earnings against share price that this is a name that does not trade on the back of its prospects, but rather as a macro football to be punted around depending on sentiment towards the EU, monetary policy and European politics. The share price and the trend in forward estimates divorced as soon as Draghi made his “whatever it takes” speech in the summer of 2012. The concern for shareholders must be that the stock appears to be heading back down towards trend earnings as part of a multi year loop and EPS Momentum over the past month is -4.6%. The confirmation of QE in Europe earlier this month appears to have offered little respite and the ability of the central bank to influence the stock market may be seriously on the wane. The contrast with Swedish banks is stark. Here is the same chart for Svenska Handelsbanken. It shows that the weakness in Europe in 2011, which was eventually addressed by Draghi’s comments, did not impair the upward march of earnings. Despite the stock rising 31% over the past year and outperforming the sector by 36%, there remains a considerable gap between the two lines. Had Nietzsche been alive and expressed any interest in stock markets, he might have concurred that the charts showed a major shift in power, from central bankers back to investors, or more broadly from rigged markets back to those that are fundamentally driven. However, as the great philosopher knew, perception is everything, including of his works, which may well never have included the direct quote above, however much his “All things are open to interpretation” may have implied it. What is clearer is that the ECB’s interpreation of events no longer paases muster among equities investors.